South Africa’s financial services industry manages an estimated R1.23-trillion of the country’s wealth. 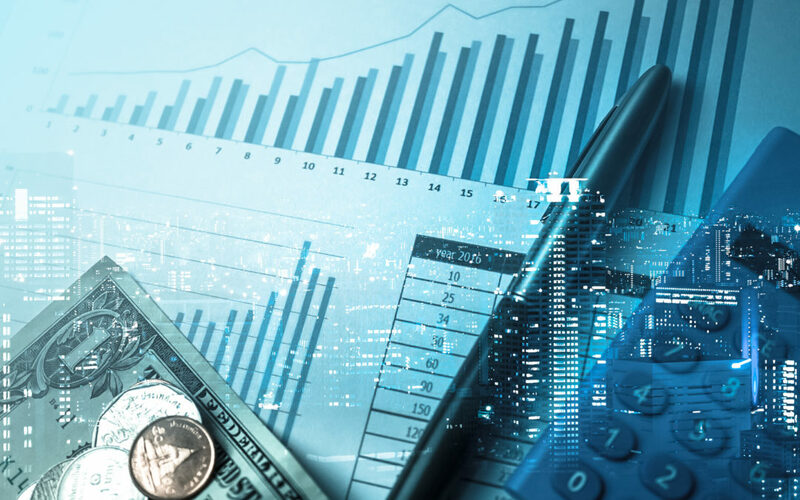 According to Mail & Guardian the pace of change in the financial services sector has come into sharper focus as it continues to contribute significantly to the economic growth of the country. 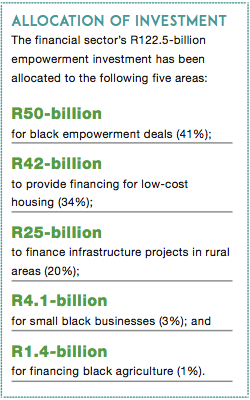 Over the last five years, the financial sector, including banks, insurers, pension funds, brokers, private equity firms and investment scheme companies, invested approximately R122.5-billion (10% of the wealth managed by the sector) in funding black economic empowerment. Banks were committed to invest R80.5-billion in empowerment financing over five years, and long-term insurers R42-billion over the same period – making up the total amount of R122.5-billion. The Charter, signed in 2003, deals with empowerment in the sector, focusing on providing black enterprises with access to banking and other services. This commitment to empowerment financing came as a result of negotiations by the National Economic Development and Labour Council (NEDLAC), held at the 2002 Financial Sector summit. Key industry players and partners of NEDLAC committed to help remove economic inequality in order to help establish a thriving and all-inclusive economy. In order to balance this inequality, it is crucial for the sector to invest in empowerment to ensure South Africa’s long-term socio-economic and commercial success. What is imperative for the successful implementation of B-BBEE is the sector’s capacity to facilitate commerce – both locally and internationally. Because financial institutions hold a unique position in the country, two new key elements were included into the scorecard. According to the Department of Trade and Industry (dti), two new elements in particular – empowerment financing and access to financial services – will help the inclusion of previously disadvantaged groups into the mainstream economy. In 2015 Economic Development Minister, Ebrahim Patel announced that the Industrial Development Corporation (IDC) was allocating R23-billion towards black industrialists. Supporting black economic empowerment has been central to the IDC, although over the past 21 years the focus has seen a seismic shift from supporting BEE ownership to the creation of black industrialists. To this end the funding will increase to R100-billion over the coming five years. The FSC also aims to provide B-BBEE transactional financing for black entrepreneurs to acquire an existing or new company – in any sector of the economy. In addition to this, the FSC covers debt financing, credit extensions and equity investments into BEE companies. Access to first-order retail financial services is key to empowerment and the growth of the economy. This includes savings accounts, contractual savings products, collective investments and community-based savings schemes. Also included in this list is credit for low-income housing, agricultural development, financing black SMEs, establishing black SMEs and insurance products like life insurance, funeral cover, household insurance and health insurance. According to Minister Rob Davies, it’s imperative for the financial sector to provide investment capital and to support the productive sector, as well as small enterprises and micro small enterprises. He states that if the country aims to create 11 million jobs by 2030, the small business sector has to expand exponentially. The sector can assist Government achieve this by reducing the red tape for small businesses and easing access to finance. The allocation of the different amounts into the various areas has had an overall impact on the economic growth of the country. However, black empowerment deals and investment into black businesses don’t necessarily guarantee job creation – it may only mean that shares shift from one elite to another. This in and of itself is an important consideration for long-term plans to change the equity ownership profiles of companies. A powerful catalyst to facilitate growth is the investment into infrastructure as this means ample employment opportunities, as well as the strengthening of basic service delivery. The theme was transformation at the annual summit held in August 2016 by the Association of Black Securities and Investment Professionals (ABSIP). Deputy President of the organisation, founder and Chief Investment Officer of Perpetua Investment Managers, Delphine Govender, emphasised the importance of creating an inclusive investment industry, which will deliver better outcomes for clients, noting that a level playing field results in job creation, business opportunities and growth in the economy.